Extra Large Hard Case for 6", 7 inch GPS is perfect to store the GPS in to keep it from getting scratched or damaged. Bottom with an elastic band to hold the GPS and there's a pouch on the Lid to hold the charging cord and other small accessories. ✦For GPS with a 7 Inch Display Garmin Tom-tom Magellan Gps Navigator etc. ✦For Garmin Nuvi 2639Lmt, 2689Lmt, Nuvi 2699, 2797Lmt, 2757Lm, Garmin nuvi2797, 2798Lmt, 2789Lmt, Garmin Dezl 560Lt, Rv 760Lmt, 2978, 770 LMT- S etc. ✦For Tomtom Go 600, 60S, 60, 6000, Via 1605 M Rv, Go 500, 50S, 5000, 7150, 5150 Truck Live etc. ✦For Magellan Roadmate 1700, 9055, 9250T-Lmb, Rm9200-Lm, and Rv9145-Lm etc. 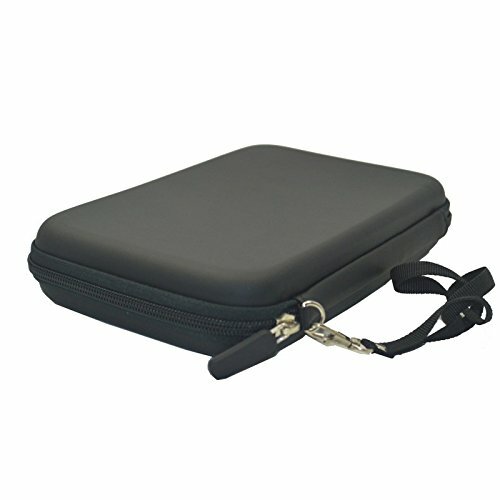 ✦【WATERPROOF COVER】: GPS case is made by highly waterproof material-EVA PU. Even with zipper, it also can resist water splash, normal rain, snow, but not soak in water. ✦【PORTABLE DESIGN】: You can take it beside you anytime even you're climing, bike cycling or other outdoor sports with Wrist Strap. That will be pretty portable and convenient to check. ✦【HARDSHELL ANTI-SHOCK PROTECT】: Hard Shell covers offer secure protection for your devices invoid screen scratch with shockproof and anti-dust. ✦【USER FRIENDLY INTERNAL ROOM】: Design with mess pocket for USB cable, card, car charger, earbud etc. Inside an eclastic band provide your devices with better protection. Case Outside Size(Approx): Length 8.5" Width 6" Hight 1.5" Inside Size(Approx): Length 7.7" Width 5" Hight 1.2". If you have any questions about this product by Bgjoy, contact us by completing and submitting the form below. If you are looking for a specif part number, please include it with your message.